Our class has been using YouTube to record messages using Google Hangouts on Air (GHO). Our messages have been created for other classes. We have found that creating video messages for others is a great way to engage them and to have them learn about, and take the risk, to create a video response. We feel as though we have the perfect set up for our class. Our computer, camera, and microphone are always ready to be used - we can create a video or respond to one in just minute. how to model responsible risk taking and invite others to try something new/different. We will continue to connect with other learners to share our learning and encourage them to do the same! With a few more months left in the school year, we look forward to connecting with more people to benefit our learning and growth. We believe there's no better way as an educator to feel refreshed and re-energized than by connecting with other passionate educators and learning about best practices, exciting new technologies, and problem-solving to help our students be the best 21st-century learners they can be. The "Connecting Kids and Collaborating Teachers" offered such an opportunity. 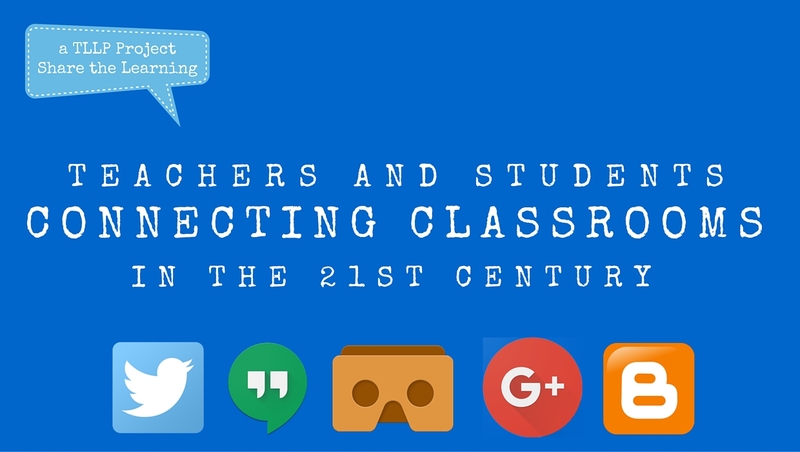 I don't know about you, but after Monday's conference, I felt ready to jump in to engage students and enrich their learning through opportunities using Blogging, Hangouts, and VR. We wanted to consolidate our learning from Monday in a neat package and came up with this. Enjoy! Who said they don't like Mondays? Sometimes I feel pretty fortunate to be able to do what I do. Yesterday, I got to join fellow educators at the KPL to discuss ways in which we can connect and collaborate with teachers and students within our board and beyond. It was energizing to hear colleagues speak about the great work they are doing and the ideas that they have. 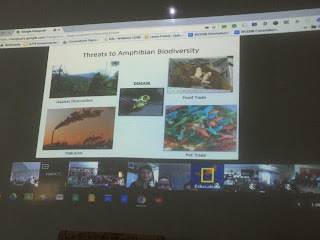 I tagged along with Katrina Gouett and together we led a session on Google Hangouts in which we tried to illustrate how Hangouts could lead to opportunities to connect classrooms. I absolutely loved looking at people's faces when they learned that Hangouts could be recorded or broadcasted live -- you could just see the light bulbs going off; the possibilities for learning, for connecting. It was very cool! After the second session as people were starting to transition to another space, a young man with a beard and glasses, wearing an overcoat and toque, approached our table and said, "Mr. Rodrigue, I knew that was you." He went on to speak about his time as a student in my grade 7 class (he's now 21) and the impact that I had on him. I can't begin to express how grateful and humbled I am by this experience. I've been teaching for almost 18 years and I still question what I do, how I do it and how I can improve at it. The internal dialogue and self-reflection is constant as I believe it is for many teachers, particularly the group of teachers who attended yesterday's conference. While walking home from the KPL, I felt doubly fortunate: I got to start my week by learning with colleagues about how we can better connect with teachers and students and, as luck would have it, I was able to see how important these connections are to the students we are working with. Excited to explore Blogger with fellow WCDSB educators this afternoon! Check out the Slide Deck below for ideas and suggestions for getting started. Add your reflections on Blogfolios for class and student reflection in the comments below! This afternoon we connected with a parent expert in our class who works with machinery to produce metal works. As an mechanical engineer, he had lots of teach us about design and product production. With our 3D printing project, we keep seeing the word "micron" and wondered what it's all about. Mr. S was in our classroom for conferences, noticed the word on the board, and mentioned that he could help us out. Very cool! Connecting with experts in the real world is so valuable for expanding our learning and making it more memorable. Microns are a very fine unit of linear of measurement. At his workplace, measurements have to be perfect to get exact results for parts and products for customers. For example, they have printed landing gear for aerospace designs! Mr. S showed us the gauge they use to measure microns. Since it is measuring units so small, you need to be very careful when using it. He took us on a tour of the shop and showed us a metal Eiffel Tower being trimmed by the machine. It is about 0.5m tall. It was very helpful for us to 'hangout' with Mr. S today and we are now connecting our learning about microns with our 3D printer. Over the past few weeks we have been learning about ecosystems and the impact humans have on their delicate balance. My teaching partner came across this website and we signed up for a camera spot. 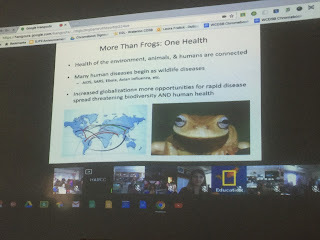 We connected with National Geographic Education's special guest Jonathan Colby who is studying frogs and the impact of the Chyrid fungus on their survival. The students listened intently as he described what he does (loved the idea of hanging out in tree canopies in the rainforest), and how they are working to protect amphibian species. 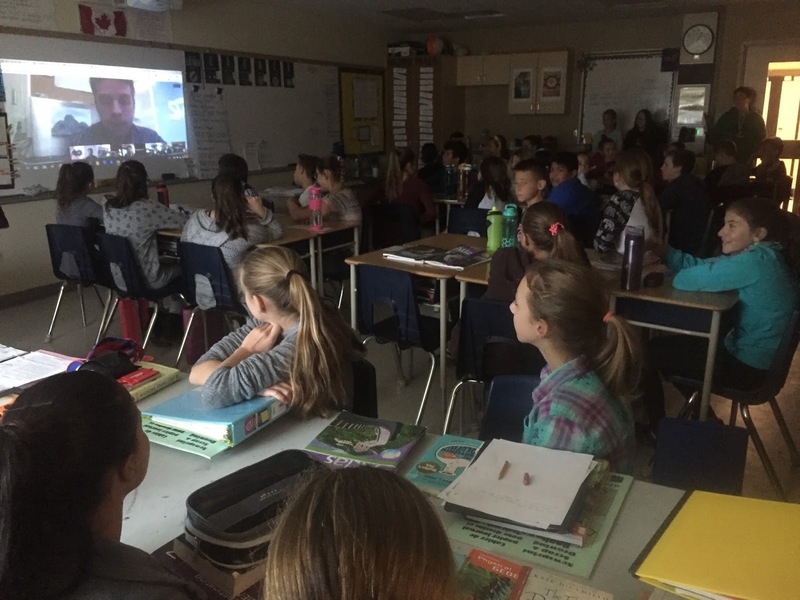 Students from all ten connected classrooms from around North America had the chance to ask questions at the end of his talk. It was an incredible opportunity to connect with an expert and really brought the curriculum to life. Grade 7 Students listening to Jonathan Colby's talk. Provoking thinking about human impact and change. Connecting with experts and organizations through Google #hangouts provides us with such an incredible opportunity to make the curriculum come to life for students. It is empowering for them to see and hear how people are making a difference in the lives of others (& lives of frogs).